Dr. Ray Russo, geophysics professor at the University of Florida, works on the flow of the Earth's mantle and its relation to global surface tectonics. To figure out how the Earth's mantle flows in situ, he uses temporary field deployments of seismometers (currently in southern Chile, and most recently before that in Hawaii), freely-distributed seismic data, and computer modeling of large-scale tectonics. 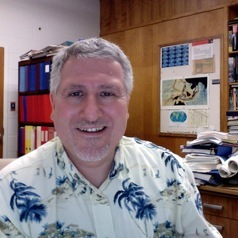 Russo has taught undergraduate and graduate classes in physical geology, structural geology, tectonophysics, terrestrial gravity and magnetism,and seismology. He also developed and taught a course aimed at examining connections between physical sciences and the arts, called Science and Art in the Western World.